This is not an ordinary post, I have a large one coming but this one is special. Today would have been my grandmother’s birthday. As many of you know she is who inspired me to follow my dreams search for my happiness and travel in whatever way I could. I thought as a tribute I would share a few stories about my grandmother with you all. My grandmother was the kind of person who saw how beautiful someone was no matter how ruffled they might appear on the outside. Anytime I would introduce her to any of my friends, for years and years and years after she would always tell me what a wonderful friends I had and how beautiful they were. I loved holding hands with my grandmother, she would always call me her cuddle bug. When I was little I was a very picky eater. I remember one week visiting my grandparents and going for a picnic where grandma had made sandwiches for us. Mine had mayo and I hated Mail. I had to eat my sandwich but I swore I would never eat mayo again. Now I love mayo and could drink it from a bottle. I would often go visit my grandmother if I had vacation time or for holiday. The last time was when my sister and I went down the Christmas before she died. The Rihanna song shine like a diamond had just been released and seemed to be playing every five minutes. My sister and I kept saying how annoying it was but by the end of the week it seemed to be our theme song. We often tell each other now that hearing that song reminds us of that week. It was entertaining watching my grandmother with all her church friends and everybody flirting with one another and joking and seeing her being happy. The weekend before she died I flew from New York to visit her. I have been told that I might not make it in time to see her before she died but I made it and she somehow had one more lucid day where she just seemed normal. I painted our nails matching colors like I always would do when I was little and lay in the bed next to her snuggling and napping. One of the last things that she said to me was when she gave me some of the best advice I have ever gotten. She told me I needed to be happy that was all she wanted from me was to be happy and be a good friend to my friends. I remember listening to her talk to my mom and aunt about her belongings and silver in her home. She said do what you want with it it doesn’t matter and that really stuck with me. The realization that at the end it doesn’t matter what you have it doesn’t matter all of the belongings that you have accumulated and how much they’re worth. To be told that all through life is one thing, but witnessing it is different. When I cried she said, “don’t cry you’ll make me cry and I don’t want to be sad about this.” I don’t know when I could ever stop being sad about losing someone I thought would never leave but I do know that by following her wishes and advice I have been launched into a different direction of life that I never imagined heading in. I feel her around me when the wind blows, when I see little butterflies following me, and when I see spring flowers because we both agree that was our favorite season. When I accomplish major milestones I feel like I can confidently say she’s proud of me and what I am doing. I wish that we could celebrate her birthday together every year but that’s just not the case so I will continue with my journey however it may take shape and know that she’s following me every step of the way. 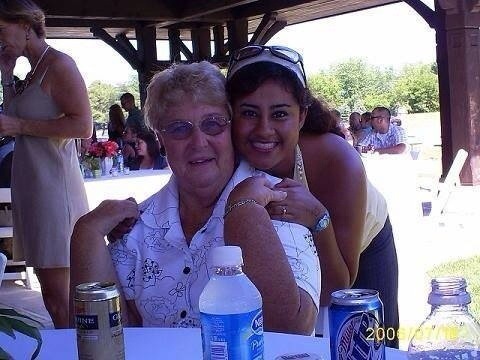 Maria, this is a beautiful tribute to your grandmother. You are fortunate to have shared such an intimate relationship with her. I love what she said to you about being happy. I know she really loved you.